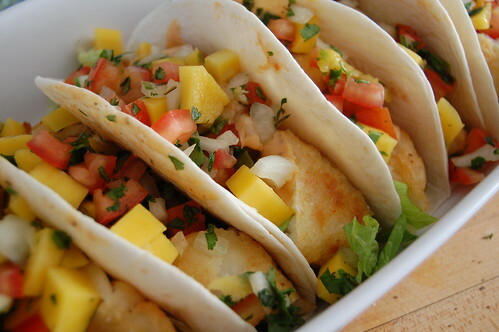 Fish tacos are a great way to make over traditional tacos. With all the health benefits fish have to offer, why not incorporate some into your next taco night or meatless Lent meal? Research has gone back and forth about whether or not it is safe to eat fish and in what quantity. The good news is that a recent study conducted by Harvard School of Public Health, found that yes, you definitely want to eat fish! It is recommended that you eat up to two portions of fish a week. One portion of cooked fish is the size of a checkbook, about 3 ounces. The way the fish is prepared is important if you are watching calories and heart health. Baking, broiling, steaming and poaching are the best ways to cook fish (watch the butter or oil when cooking). When fish is fried, a lot of health benefits are lost and extra calories and fat are added. Researchers have found that the oils in some fish (salmon and mackerel in particular) decrease the stickiness of the blood, therefore reducing the blood from clotting. Super bonus! This recipes is from Delish.com. To prepare fish: Combine chili powder, lime juice, oil, cumin, onion powder, garlic power, salt, and pepper in a small bowl. Rub adobo all over fish. Let stand 20 to 30 minutes for the fish to absorb the flavor. To prepare coleslaw: Combine sour cream, mayonnaise, cilantro, lime zest, lime juice, sugar, salt, and pepper in a medium bowl; mix until smooth and creamy. Add cabbage and toss to combine. Refrigerate until ready to use. Just before grilling, oil the grill grates or use a grilling basket. Grill the fish until it is cooked through and easily flakes with a fork, 3 to 5 minutes per side. Transfer the fish to a platter and separate into large chunks. Serve the tacos family-style by passing the fish, tortillas, coleslaw, and taco garnishes separately. What’s your favorite way to eat fish tacos? My husband makes the best fish tacos. He uses cod. We like white tortilla wraps grilled. We build our tacos at the table with different combinations. The wraps, type of fish and shredded cabbage are the base. On the table: tomatillo salsa, fresh lime, cilantro, homemade mayo and cubed tomatillos and one other aioli inspired usually by Rick Bayless. Mmmm, those sound delicious and so healthy! Thank you so much for sharing LaTonya! !